The last 430 mile athlete, Uwe Paschke, finished his race and was super happy. Once again, congratulations to all finishers! And a big thank you to all athletes who came to the Yukon to try it. I will soon write a little summary report on how things went. Since all 430 milers were in Dawson before Feb. 18th, parts of the crew and some athletes already left for Whitehorse on the 17th. Yesterday the last shuttle bus brought back everybody else. All transports made it south without any problems and we had a very nice get together at the Coast High Country Inn. The results tabel is almost complete and hopefully I will soon be able to upload more photos. Antje from the volunteer team has set up a Dropbox account and I can upload any photos from anybody who is willing to share. As soon as it is all done, I will let everyone know how it works. If you want to contribute your photos, please send these to me via wetransfer.com (really easy tool). Re. Joe Bishop’s photos, I will talk to him and we will decide how these can be accessed and used. I should soon be able to email out a survey and hope to get as much feedback as possible. The feedback I have already received was very positive. However, I am sure that there are things we can still try and improve. So, please do feel free to give me your input. I want to thank our sponsors. As always, this race would be impossible without them. It was only due to Montane’s contribution that we were able to have Yann and Thilo with us to film and make the race even more interesting to follow. Montane also always supports the crew with clothing and I have seen many athletes out there using Montane product. It’s great quality and it simply works! Thank you to Primus for supplying fuel and stoves and Carinthia for the great sleeping bags. Thank you to our local sponsors Driving Force, Total North, Yukon Yamaha, Coast Mountain Sports, Coast High Country Inn, Downtown Hotel and Yukon Quest. A BIG thank you also to the Canadian Rangers for putting in that trail. Thank you Yann and Thilo for your videos. I will watch these many times and I am sure the same goes for all those involved in this year’s MYAU. Thank you to our checkpoints: Rolland from Rivendell Farm, Steve, Lee & team at Braeburn Lodge, Bernard at Ken Lake, the Carmacks Rec Center, the Kruse Family at McCabe, Selkirk First Nations in Pelly Crossing, Sue, Dale and the tireless helpers at Pelly Farm, the KVA in Dawson City, Stewart Stirling who was in charge of Dog Grave Lake and Indian River. Last but certainly not least THANK YOU to the crew! You have been amazing. Diane, Lucy, Sue, Adam, Stu, Sarah, Trish, Celia, Theresa, Mandy, Julie, Antje, Jo, Friedhelm, Marcel, Marta, Pam, Graham, Mal, Alfredo, Jessica, Mike and the guides Gary, Glenn, Spencer, Tony, Ross, Robert, Tom, Joe. Great job eveyone. Jessie Thomson-Gladish crossed our Dawson City finish line at 01:04. It’s the second time she finishes the 430 mile race. Once again she has amazed the entire crew with her performance. She is always in a good mood and she still does not seem tired. Superhuman! Now we are waiting for only one more athlete. Uwe Paschke from Germany is not far away. All other athletes who still were in the race finished on Feb. 16th. For the times please check our results table. It has been an extremely challenging race this year. Very cold, high humidity, fresh snow, „warm“ with soft snow, wind blown trails, … you name it. So, congratulations to all athletes who were able to overcome all these challenges and arrive here in the city of the gold rush. Today Daniel Benhammou (at 19:42), Jan Francke (at 20:19) and Julian Hall (at 21:34) reached our 430 mile finish line in Dawson City. Daniel (USA) who already is a 300 mile finisher took 3rd place. He said he kind of had forgotten just how long these days out there are. Jan Francke (Czech Republic) had already tried the 430 miles in 2015 and had to scratch at the time. Back then he started out too fast and got problems with his achilles. This year he took it a bit easier and it worked out great for him. He is still in really good shape. No major pains. Jan takes rank 4. Julian Hall (UK) has had problems with his achilles over the last couple of days but decided definitely not to stop this close to the finish line. So, he is suffering but with a period of rest he will recover and I am sure soon start planning his next adventure. Julian places 4th. Now we are waiting for Boris Tramm from Germany who should be here in the early morning hours. 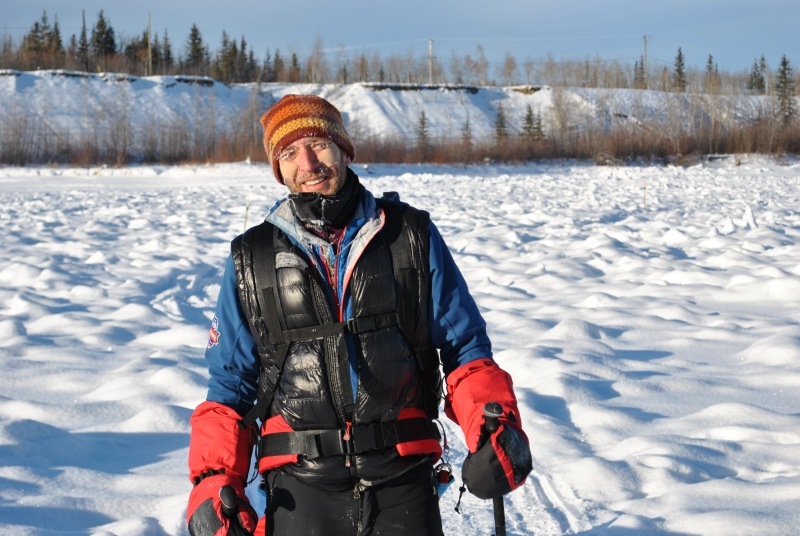 Enrico Ghidoni from Italy arrived at the Dawson City 430 mile finish line today at 08:40. Simon Reed from England arrived 11:40. Enrico had received a time penalty of 12 hours for forgetting his mandatory down jacket at Carmacks CP. As this would have meant a change in results, Simon Reed’s insulation jacket was checked upon his arrival in the city of the gold rush. Unfortunately, Simon could only show an insulation jacket that clearly does not comply with the race rules. Which resulted in a 12 hour time penalty for him. It seemed the fairest possible solution. Both made mistakes with mandatory kit and both received a penalty. So, in the end Enrico who did reach the finish line first also placed first in the foot category. Both showed an incredible performance and are winners. Congratulations! We are now waiting for the next athletes to finish. All of them are making good progress and should finish before the cut-off time on Feb. 18th 10:30 AM. Stefan Zahlten from Germany crossed the Pelly finish line yesterday at 19:30 to place 2nd. At 23:15 Laura Trentani from Italy finished for 3rd overall and 1st in the women’s category. Borja Fernandez arrived at 06:38 this morning. He is 4th overall and 3rd men’s. All of them were on foot. Great effort guys and congratulations! It’s nearly a week since the start of the race and things have settled down after a pretty challenging start – with very cold temperatures on the first three days of the race we saw a large number of athletes who had to scratch due to frost bite and injuries – the current theory for this unusually high dropout rate is the humidity levels are higher than normal combined with temperatures of -35 degrees C. Also it seems a lot of athletes may have pushed too hard at the start. Nevertheless everyone’s attempts are to be applauded. With all the will in the world sometimes our bodies just let us down. Anyway, not to dwell on that, the remaining racers are doing extremely well –Bernhard is motoring towards Dawson and expected to finish in the next 24 hours. Enrico the legend has stormed ahead, followed swiftly by Simon Reed. HQ is now on the move and situated at Pelly Crossing where we have been welcoming a stream of athletes steadily through the night. As they stumble in they are now dusting the snow off their clothes and pulks. There’s a constant down pour of snow out there – not quite a blizzard but it does feel like Christmas! This will provide new challenges for the guys and girls out on the trail – visibility is down to about 75m and people will start getting wet. The trail will be softer on the feet and some may want to get their snow shoes out. Life here as a volunteer at Pelly Crossing is pretty cushty with a warm building to sleep in, a fully equipped kitchen to heat water and make food for the athletes, internet and the possibility of a shower in the nearby motel, not to mention the handy gas station and convenience store where you can buy food and random purchases. It’s far from the experience at a remote check point like Scroggie Creek and Ken Lake. So for those who have not experienced life in a remote check point I thought I’d describe what it takes to set up and run the first remote check point, Dog Grave Lake. Dog Grave Lake is perhaps one of the most important check points in the race and has certainly featured highly on everyone’s radar as there were so many athletes scratching there this year. It is situated approximately two thirds of the way between the start and Braeburn – the 100 mile finish. The only way to access it is by snow machine and that is a good two hour ride in from the road access at Takhini River. It is a major stopping point; there is a medical station, hot water and a meal provided as well as a nice open fire to sit beside drying off and warming up before skulking away into your scratcher for a bit of kip. All this luxury accommodation, however is temporary and has to be set up prior to the racers arriving. Due to its remote location everything has to be brought in by snow machine. This is no mean feat – three big tents with stoves, chairs, tables, sleeping cots, equipment for a mobile kitchen, chainsaws, ice auger and water pump all have to be hauled in to provide for the athletes. It also requires six volunteers and a manager to run it. Aside from Braeburn it caters for the most number of people because it is within the first 100 miles. Stewart Stirling is the DGL manager and starts getting things organised a couple of weeks in advance of the start of the race. He gathers together all the equipment that has been stored over the last year – Glenn Toovey, Skidoo Guide kindly stores a lot of this equipment at his house near Whitehorse. 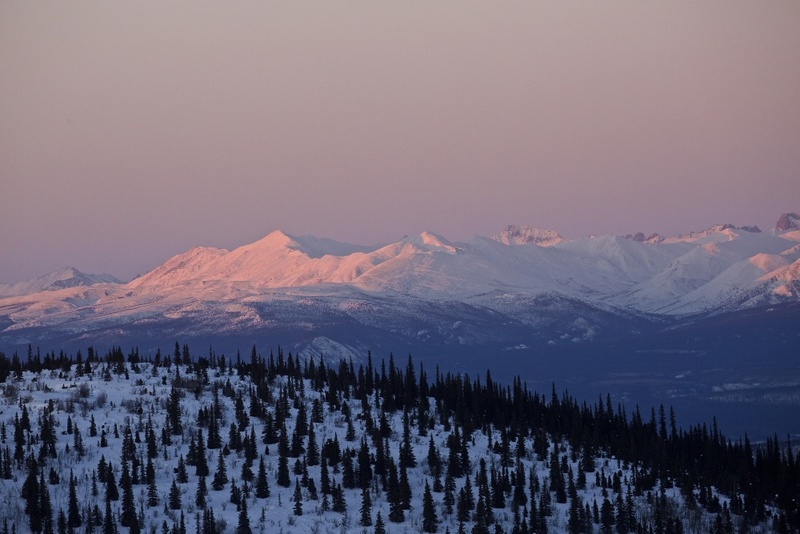 Based at Braeburn Lake, Stewart rides in from that end with all the equipment the week before and spends a day there, usually with the assistance of one or two of the other skidoo guides and sets up the tents and builds the stoves. He takes his chainsaw and goes off into the bush to cut dead fall to use for the three stoves and open fire in the camp. On race day he packs up the skidoo skimmers with the food and other remaining equipment, loads up his crew of volunteers and off into the wilds they head. 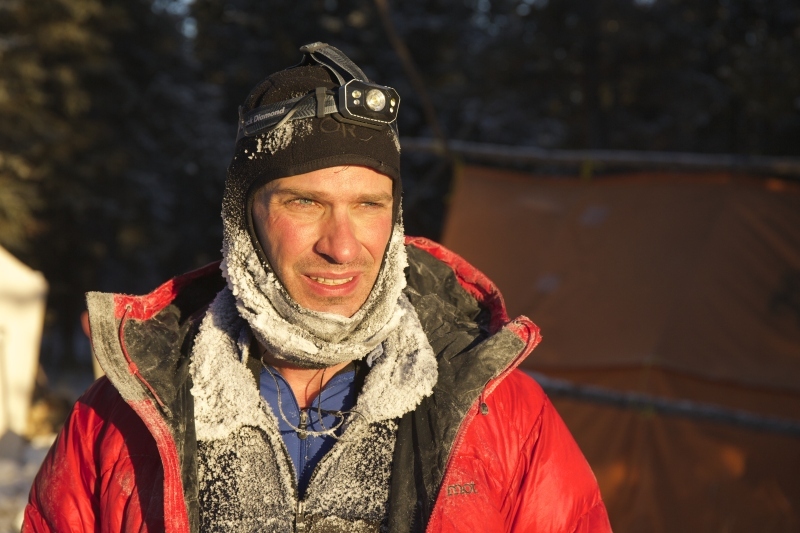 Once they arrive at DGL, they set about lighting the stoves and have to go down to the lake to get water – this involves hand drilling a sizable hole in the lake with an ice auger and a hand pump to fill 25 litre canisters which then get hauled back up the hill to the camp. The pots go on the stove to heat the water for the imminent arrival of the athletes and the medical tent gets organised. The volunteers are given a tent to sleep in with fir branches to insulate the floor and cots to sleep on if their lucky. When the athletes start to pour in all hell breaks loose with water being dished out, food bags heated and distributed, blisters poked and taped, fingers and toes inspected and the “Hot Chocolate Police” rationing the drinks. Just don’t cross her or you won’t get any! Stewart organises the management of the check point in military fashion, assigning strict shift timings to the volunteers to ensure that everyone gets enough rest. Among duties for the volunteers are heating up the pre-packaged homemade stew for the athletes and heating water for their thermos flasks. More arduous tasks are collecting water as described above and cutting firewood. 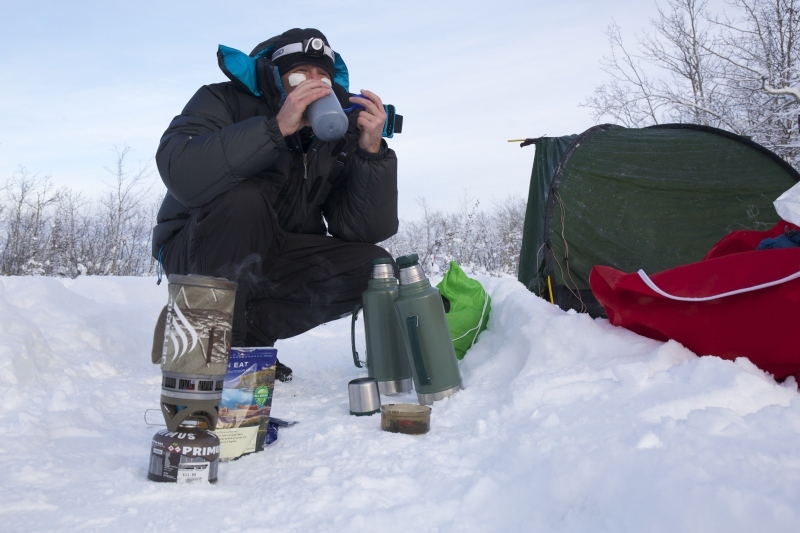 Sleep time can be a challenge, although the tents are warmed by the stoves – wood burning stoves locally known as “hippy killers” – if you let them burn out the tent gets cold pretty quickly especially when it’s 35 below outside. Communications from the remote check points are limited to satellite phone and InReach text messaging so any news from or to HQ has to be laboriously typed out using old school text messaging or via a blurry delayed satellite phone line. The medics’ job in the remote check points can be quite a challenge – obviously hygiene is not all it could be owing to the fact that there is no sterile environment in which to examine your patients and the light can be poor for inspecting wounds and blisters. But they do a great job and treat the various ailments as best they can in such a limited environment. It all sounds a bit hard and demanding but there are some plus points – being so remote and being close to the wildlife was one highlight – hearing owls hooting in the woods and wolves howling from across the lake. Riding in on a snow machine – despite it being a chilly trip as a passenger was a major plus point for one volunteer this year. The stunning views and the camaraderie of the team all made it a pretty cool place to be. Another interesting point about Dog Grave Lake is that there is actually a dog’s grave there! Dooley the dog, was buried there when he died on the trail to Dawson, he belonged to a musher who regularly used the trail between Whitehorse and Dawson City. So life as a volunteer has its down sides and its plus points but one thing is for sure it’s an experience! 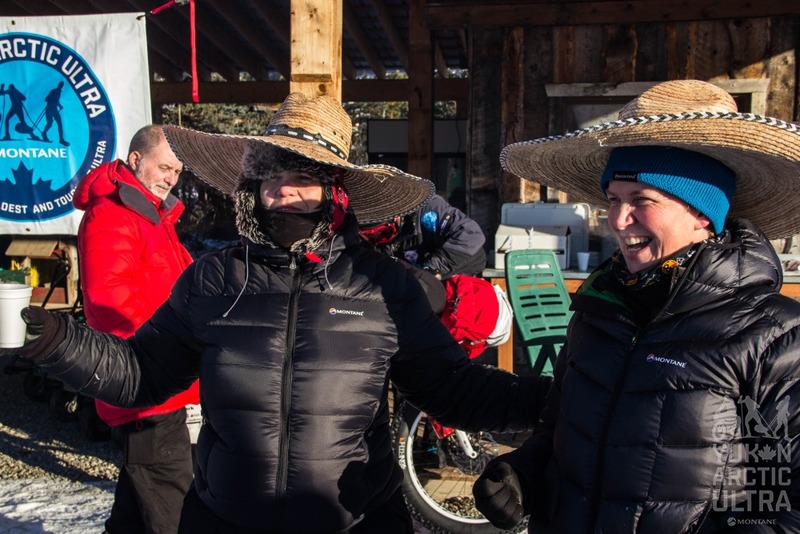 I first came to the Yukon as a volunteer on the race and instantly fell in love with the place – the people, the culture and yes, even the weather. This is now my fifth race and I never imagined I would be living half my year in such an incredible and varied environment. 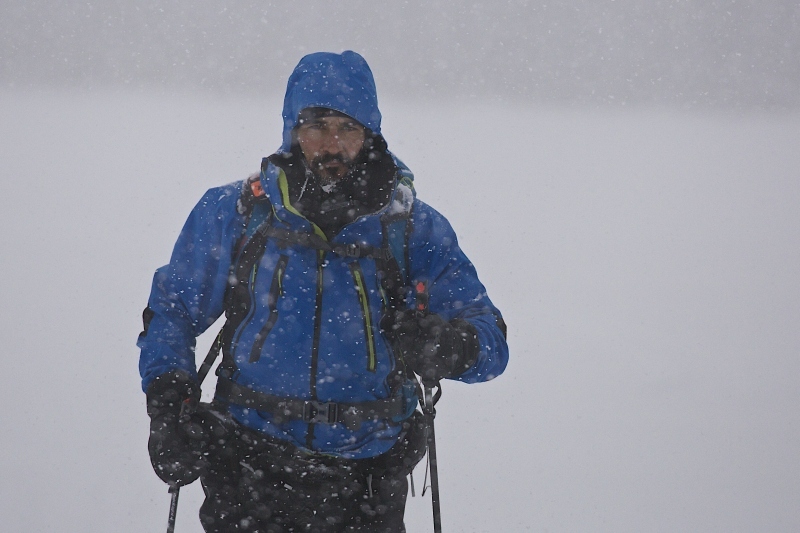 Steve Hayes from Wales wins the Montane Yukon Arctic Ultra 300 mile race. 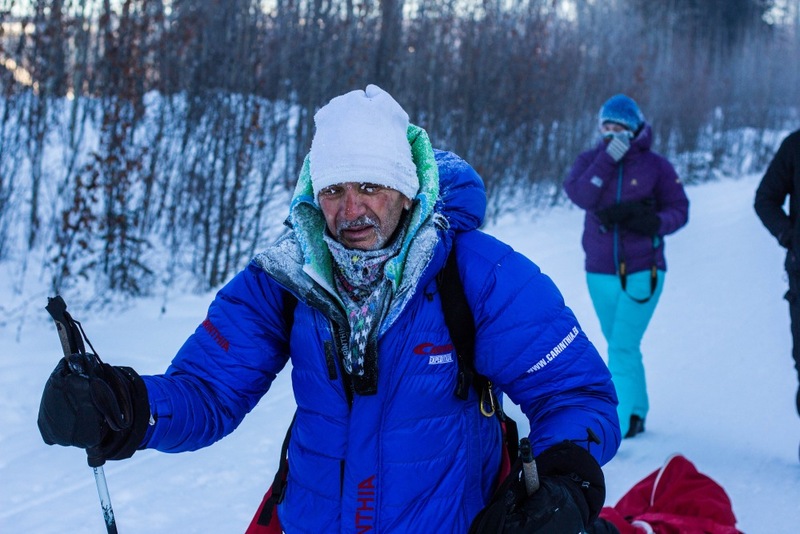 He arrived at the Pelly Crossing finish line on Feb. 12th at 11:20 local time. He is super fine and happy! So, is the entire crew. Congratulations Steve!